This is the most common type and is almost always dried before being packaged. It is made using only wheat flour and water. Given the extremely short list of ingredients, the quality of the flour used is extremely important. All high quality commercial pasta is made exclusively with semolina flour (flour obtained from a special hard wheat called durum wheat). Most high volume pasta is extruded using stainless steel dies producing a very smooth surface. 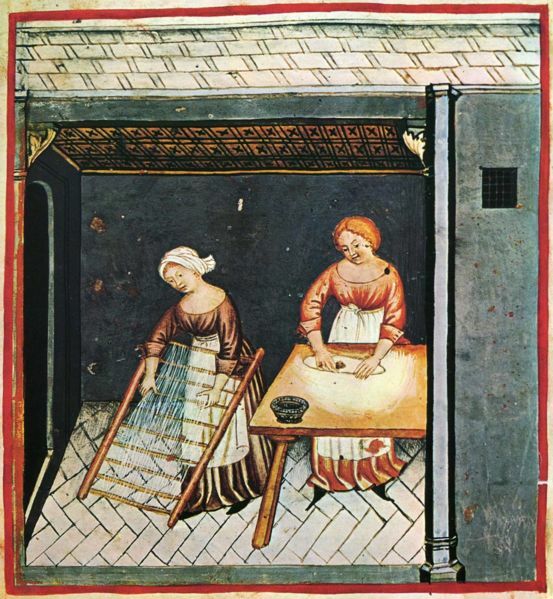 Pasta from small artisan brands is often extruded using bronze dies. Bronze dies will produce a rougher surface that improves the sauce coating of the pasta. 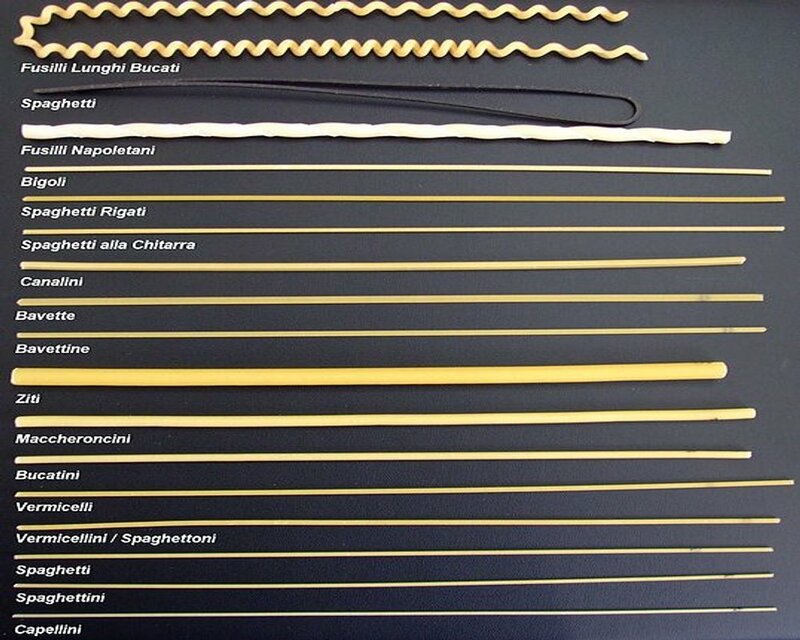 Water pasta is available in many different shapes. The richer flavor and softer texture of egg pasta makes it somewhat less versatile compared to water based, but for some dishes it is indispensable to bring out the full potential of the sauce. Egg pasta is usually made with wheat flour and whole eggs but it can also be made with egg whites or egg yolks exclusively. Egg pasta can be purchased either fresh or dried. Fresh egg pasta is perishable and usually found in the refrigerated section. Dried egg pasta is shelf stable and is usually in the same section of water pasta. 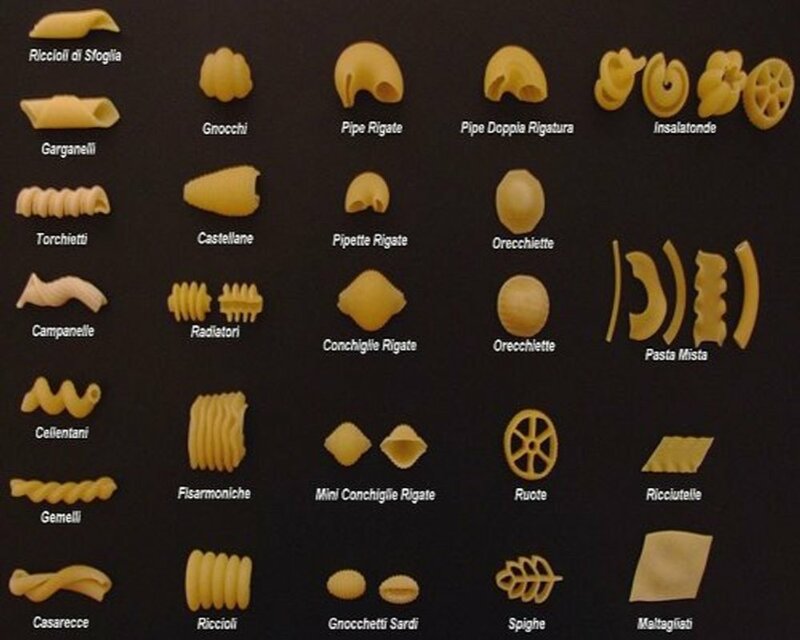 Egg pasta is also available in many shapes. Small to large pockets or dumpling of egg pasta dough stuffed with cheese, meat or fish based filling. The two basic shapes are ravioli (pocket shape) and tortelli (folded dumpling shape). Common traditional fillings are ricotta cheese and spinach for ravioli and veal/pork meat for tortellini. Many different type of stuffed pasta are available depending on the size and the type of filling used. All not stuffed pasta made with anything else than just flour and egg or water falls into the specialty category. flavor and color. This makes them ideal for some recipes but unsuited for many others. Spinach (green): Usually egg based pasta with addition of cooked spinach to the dough. Commonly used in combination with regular egg pasta for the "paglia e fieno" dishes. Can also be used on its own for specific dishes. Tomato (red): Egg or water based pasta with the addition of tomato paste to the dough. Commonly used in combination with egg and spinach pasta for the tri-color pasta dishes. Squid ink (black): Water based pasta with the addition of squid ink to the dough. Commonly used in selected seafood dishes.